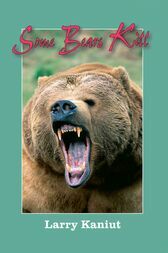 Never before have so many exciting, hair-raising tales of bear encounters been collected into one book. Read about a man who swam into a lake to try to escape a furious bear only to find to his horror that bears can swim too! Or of the old gold prospector who got mauled and sewed up his own stomach--and lived to tell about it! When a bear attacks, it does so with devastating ferocity. Although the average attack lasts but thirty seconds, grievous injury can result from powerful paws and jaws. Strangely enough, most attacks are nonfatal. This book is filled with true-life episodes of close-calls, maulings, and deaths by all three North American bears: black, grizzly, and polar. These stories are not fiction. All are, eerily enough, based on complete fact. Even FOX TV’s When Animals Attack uses Kaniut's material for its show. The author of two previous best-selling books on dangerous bears brings you a cliffhanger--you won't want to miss his latest and best yet!